<dialog> tag is used to define the window or dialog box. The popup dialogs and modals on a web page are easily to create by using <dialog> tag. <dialog> tag supports Global and event attributes. <dialog> tag belongs to Flow content and Sectioning Content category. HTML 4 is does not support <dialog> tag. HTML 5 is support <dialog> tag. <dialog> tag is used to create a dialog box. The open attribute is used to display the dialog box. If the open attribute not set the dialog box in the closed state. 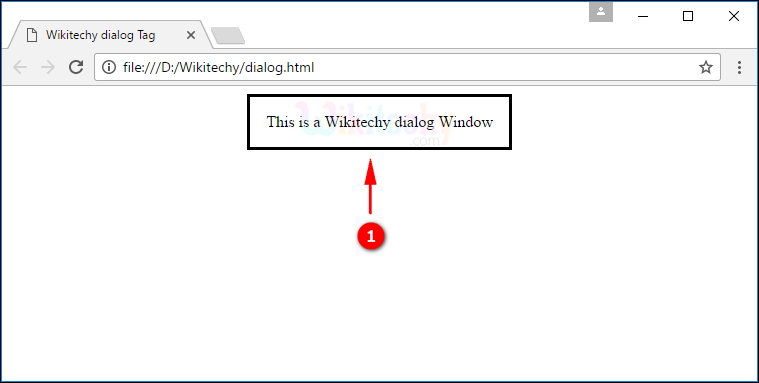 The dialog is displayed as “This is a Wikitechy dialog Window”. open open No Yes Defines that the dialog box should be active and available for interaction to the user.